It was the forty-eighth time she had said it today, according to the computer log. Nearly fifty policy-holders -anxious, irritable, impatient or merely bored - and it wasn't even eleven a.m. Number forty-eight was a man, and appeared to be none of those things; if she'd had to plump for a description, it would probably have been ....hesitant. I have no idea why, but it has taken me for ever to get around to reviewing this book. This should not reflect on the quality of the book as I really did enjoy it. I think it is just me being a bit lazy. The longer I left it to review, the less likely I was to review it. So I grabbed the bull by the horns and jumped straight in today. This is a story about love crossing the geographical divide. Mina is a single mum working in a Sheffield call centre helping customers claim on their car insurance. Peter,also a single parent and a Cambridge Geography don, is her next customer, ringing to report the first of a couple of accidents in his car. Events occur over a short period of time, which involve Mina taking home Peter's telephone number and beginning a long distance relationship by telephone. Peter and Mina become telephone pals, phoning each other to talk about their daughters and life around them. Eventually there relationship moves on further from telephone conversations, as to whether they become a couple, you will have to read the book to find out. Rosy Thornton contacted me via email after I left a comment on Amanda's blog The Zen Leaf. Amanda had reviewed the book and I mentioned how interesting it would be to read, especially as Peter has twin daughters about the same age as mine. Rosy wondered if I would be interested in reviewing it, especially as I could comment from experience on living with twins. So I was only too happy to receive a copy of the book. The twins in the book are very entertaining. The girls actually get on a lot better than my two do. Anyone who has met my daughters would know that they would disown the other in an instant, given half the chance. The book made me want to swap my twins for the delightful Cassie and Kim. In the story, Cassie and Kim are constantly talking at the same time and finishing each others sentences. It sounds really cute, until you live in those conditions. Imagine have two different radio stations playing at the same time in either ear, constantly from nine in the morning until eight at night and you will no long think it is cute. Though with the passage of time, I am getting better at switching off. All the characters in the book are entertaining and very realistic. They are all warm and funny and each have their own oddities, that you cannot help but love. Rosy Thornton has a real eye for characters and I dare you not to find a little of people you already know within them. Mina's daughter, Sal is a bookworm and everytime I read about her, I could see a version of myself crossed with Roald Dahl's Matilda. Sal will often be found reading a classic story throughout the book and I found myself writing little notes to remind me to add yet another book to my TBR list. The book is very descriptive and I found myself immersed in the world that Rosy had created. Everything is described in such detail. There is a description within the book, describing fried fish, which I cannot get out my head, because to me the description is so utterly perfect. See what you think, it may just be me. C'mon all my British readers, isn't that a perfect description for a nice bit of cod from the chippy? This is not the normal run of the mill romance novel, even though the cover is a little too girly pink for my liking. This is a book about how difficult the first part of a relationship can be. There is no hearts and flowers, but there are difficult situations that bring the most unlikely lovebirds together across a class divide as well as a geographical one. I would not hesitate to recommend this book. Rosy's style reminded me a little of Catherine Alliot, who always keeps my laughing. Thank you to Rosy for sending me a copy of this book, which I will definitely read again in the near future. 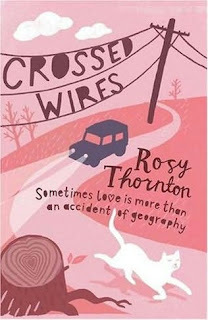 I have Crossed Wires and More Than Love Letters by Rosy Thornton unread(yet) in my bookshelf. Now I know that I have something to look forward to. Thanks for the great review, Vivienne! It just needs a pinch of salt and a sprinkling of vinegar and that cod would be perfect - deiicious. I'm with Carmen, this cover would never entice me to pick up the book. Your review will have me getting it. Great job, Vivienne. It's funny isn't it how some descriptions just get to you and stay with you long after the book is done. I really don't like the cover for this - it makes it feel too silly and dismiss-able. But the book itself is wonderful! That passage you quoted - that's one that's actually stuck with me, and the few times I've had fish since I've wished I could have it that way. We can get read good fish and chips here, sadly. Anyway, you're right, it really does capture a sensation well. I'm glad you liked the book. I think this one is highly underappreciated! Yes, the cover is too girly, but the book sounds great! Thank you for your review! As I told Amanda when she reviewed this, it sounds very different from my usual kind of read, but it really appeals to me anyway! I read this one a few months ago and absolutely loved it! Of course, being an uncontrollable Anglophile, I adored all the British humor and sayings. :) I definitely felt like I was reading a British book -- not one that's been sanitized and changed for an American audience. I totally agree with you about the characterization -- I felt like I really knew all of the characters, and I loved how realistic and believable they seemed. The steadily building romance was great, too. Definitely a good book! Ladybug - More Than Love Letters is definitely on my TBR list now. Carmen - definitely a read for autumn. As the story runs from October through to January. Petty Witter - you are so right, though I like a bit of curry sauce with my fish and chips. Kaye - as they say, 'never judge a book by its cover.' So true. Ceri - fish and chips is a British institution. Diane - you need to get it back! Nymeth - it is a very British book. She accentuates the oddities of the British public. Definitely worth a read. Jen - Mommablogsalot - I am really not helping your diet, am I? WriteMeg - it is definitely very British. I am glad you liked it too. The book sounds good and I'm with you on the cover - it's too pink! Hey Viv, that's a great review! I'm glad the author contacted you to review the book because then you can share it with us! The cover puts me off as well, but it does sound interesting. I'm glad to hear you enjoyed this book too! I was also put off by the pink cover, but I'm so glad I didn't let that stop me from reading this book. I'm definitely going to read her other books too. Oh and I linked to your review in mine!